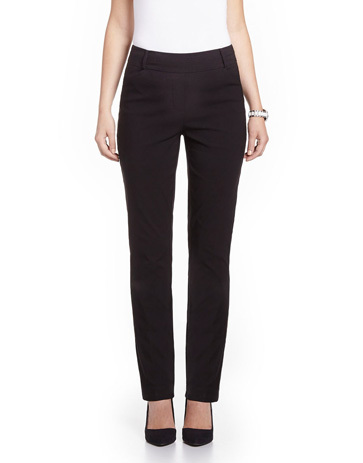 Achieve business-casual with our dark grey Iconic Leggings! Featuring two back mock pockets and a comfortable waistband, it will make your busy mornings easier. Pair it with a blouse and high heels for a stylish office look. I have very thin legs and often Reitmans is the only store where I can find a perfect fit. They fit through the waist- I am a mature woman - but are slim in the legs. These pants fit perfectly so I'm hoping that this fit will be available in shorter, summer styles. Very happy with these leggings. Comfortable and easy to dress up or down. Great for work. So comfortable and excellent fit. Love how they look. Perfect for work. I liked these leggings so much, I bought two. There like dress pant leggings. Comfy like leggings but dressier. I wear these to work. They are so cute, fit great, and best of all they are stretchy, lightweight and comfortable! Comfortable and stylish .Fits small.